Our Hostel has been settled in an old house of the heritage district, completely renovated to offer comfortable and warm meeting spaces for our guests, also has 2 terraces that offers a privileged view of the entire bay of Valparaiso. 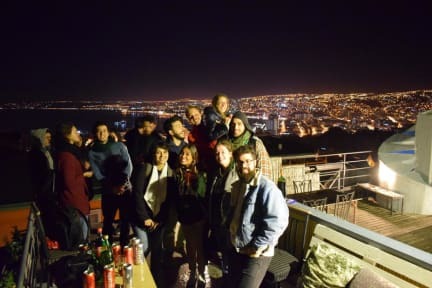 The Hostel is located in the heart of Cerro Alegre, one of the most picturesque and characteristic places of Valparaiso close to funicular Reina Victoria, Concepción, museums, art galleries and typical souvenir shops. There is also a varied cuisine and bars. We have spacious and bright shared rooms equipped with Wi Fi access, lockers and comfortable beds, as well as private double, triple and quadruple rooms, some with private bathrooms. We have several common areas where the guests can get together and exchange past experience and future plans. Check in from 14:0 .